STOCKHOLM—Works of art are sometimes lost in wars, floods, fires, and accidents. Conversely, some paintings are brought to light after having been lost for centuries. Every now and then, a real gem pops up. For several years, Stockholm-based conservator and art historian Anna Bronzoni Catellani has been analyzing a previously unknown 17th-century painting, and everything points to its being the work of the Dutch master Rembrandt van Rijn (1606–1669). A few years ago, a severely discolored and cracked portrait was auctioned off in Uppsala, Sweden. The painting was similar to a 1632 Rembrandt self-portrait in the Burrell Collection in Glasgow, Scotland, and at first it was suspected that it was a 19th-century copy. It was so distorted by nicotine stains, dirt, and aged varnish that the original colors were not fully visible. Nonetheless, a Dutch expert, who was called in, verified that it was a 17th-century painting. Clearly, the man in the picture is a young Rembrandt, but was it painted by Rembrandt himself? The new owner hired Anna Bronzoni Catellani to find out the truth about the painting. 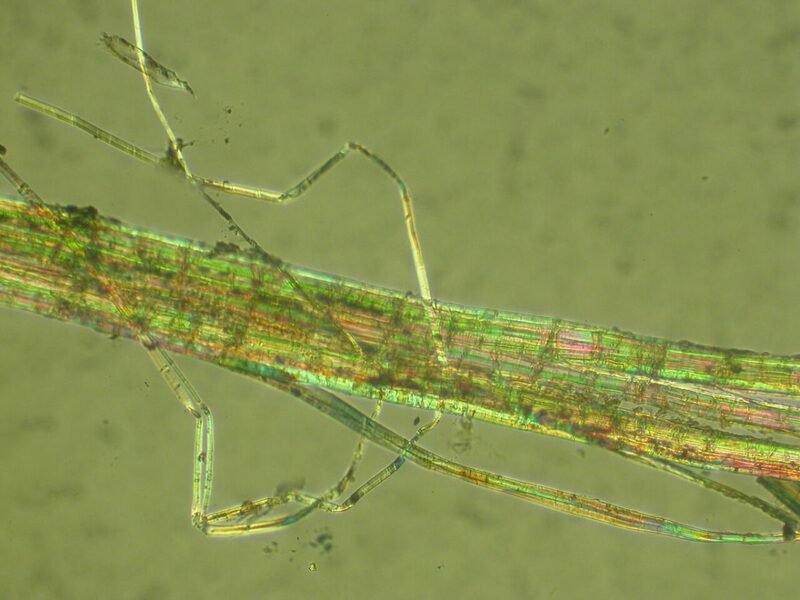 After five years of thorough analysis, the painting is now largely mapped out: Most of its provenance has been verified, as well as most of the material and methods applied in the making of it; the physical properties of the different components of the painting have been put through detailed color analysis, X-ray, as well as XRF and infrared examinations; and everything points to the same conclusion. She is waving a folding fan in front of her face, as the Swedish summer of 2018 has been unusually hot. The air seems to stand still in the small office at her studio in downtown Stockholm, but Catellani seems unfazed. She is getting close to breaking one of the biggest art stories of the decade. Attributing a previously unknown work to Rembrandt is a huge claim. For over 40 years, experts have mainly been in the business of de-attributing most of the known “Rembrandts” and instead declaring them copies or the works of his students. 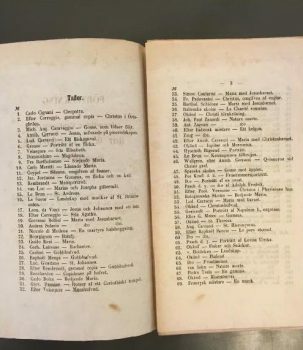 According to Dutch Rembrandt expert Ernst van de Wetering, about 800 purported Rembrandt paintings were reduced by two-thirds through the Rembrandt Research Project (RRP) headed by Van de Wetering. In many 17th-century workshops—including Rembrandt’s own—many paintings would have been signed by the master himself before they left the workshop, even if they were completely or partially the works of his students, who contributed to the workshop’s finances. Rembrandt had a total of 40 to 50 students in his Amsterdam workshop. During some periods, their output was quite significant, and sometimes students were allowed to sign Rembrandt’s works. This, combined with the fact that the master’s own style changed over time, has sometimes made it difficult to tell the master’s hand from his students’. In the current art world, however, authenticity is important, and the RRP wanted to settle which paintings were “genuine Rembrandts,” despite the fact that they were created in a context where the students’ works were of equal value. The issue of what’s “genuine” is a complex one, with a long history in which the concept of uniqueness is important, Catellani says. The rather recent Romantic view of the genius relies on this idea, she says. According to this view, the artist creates a masterpiece by way of unique, enlightened inspiration. After the RRP was finished in 2011, a re-attribution of paintings to Rembrandt began. This past spring, for instance, the Dutch art collector Jan Six presented “Portrait of a Young Gentleman” of 1634. Recently, yet another possible Rembrandt showed up in Leiden, Netherlands, and it will be on display next year. Catellani is humble before the task of giving the world a new Rembrandt. Art at this level is just as much about diplomacy as scientific proof, she says. Many spheres would be more than interested in the outcome of such a high-profile case. “When a work of art represents an entire country, as is the case with Rembrandt and the Netherlands, it’s not just a simple matter of a visual experience,” she explains. “Rather, it is an integrated part of a cultural and political scenario—a well-established jigsaw puzzle. Still, one by one, the analyses have all lent support to the theory that the painting she is investigating is, in fact, the very first self-portrait by Rembrandt. “Nothing found in this painting deviates from Rembrandt’s technique and materials,” Catellani says. Catellani dumps a stack of binders on her heavy, antique desk and begins to nimbly flip through at least five years of research. On the adjacent computer screen, his face half obscured by the shadow of the wide brim of his pilgrim hat, a young Rembrandt van Rijn is looking back at us, from a time when the first Dutchmen were settling in what would only later be known as New York, and Claudio Monteverdi had quite recently staged the very first opera. Rembrandt’s face is rounder, and his facial fuzz speaks of a younger man than the similar self-portrait of 1632. Rembrandt made over 110 self-portraits. Typically, painters would act as their own models for financial reasons, but it was also a way to market yourself and show your skill. Catellani believes that this “new” painting was his first presentation to the outside world, but that the artist didn’t feel confident enough to make himself known by adding his signature. “This raises a lot of questions. Could it be that he made this [newly found] portrait much earlier, and then chose a similar composition when he was older and well-established?” Catellani asks. ”It’s certainly reasonable that he’s eight years younger in the first painting,” she says, adding that she personally believes it was painted in 1624, or just a few years after that. Catellani has approached the portrait from two different angles. As an art historian and specialist in stylistic content, she can see the similarities to Rembrandt’s other self-portraits. In her role as a conservator, she can map out the materials and techniques used in the painting with the purpose of comparing it to the Rembrandt oeuvre. 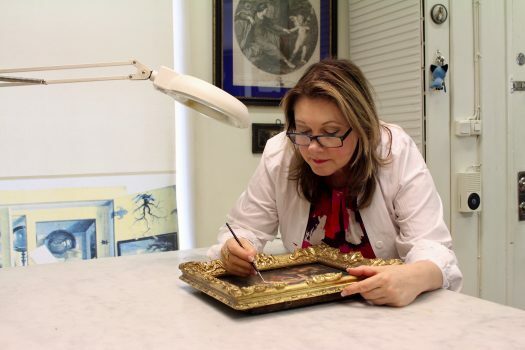 Conservator Anna Bronzoni Catellani was educated at the Palazzo Spinelli Nicolini, the Institute for the Conservation and Restoration of Art in Florence. She has also studied at the art academy in Modena, Italy, and has received a Swedish Master of Arts degree in art history from the University of Uppsala. Her main area of expertise is 16th- and 17th-century painting, and she has done conservation and restoration work on thousands of works of art over the years. She has received some impressive awards for her work, like the title of Knight of the Order of the Star of Italian Solidarity by the Italian President Carlo Azeglio Ciampi in 2005, for her contributions to the country. The work on this portrait has been less art history and more biology and chemistry, she says. From an art history perspective, there is a high likelihood that this portrait was painted by a young Rembrandt. The style and manner, as well as the use of materials, are in line with Rembrandt’s early works. Furthermore, it is not possible to attribute it to any of Rembrandt’s students. In 1624, Rembrandt was still studying with his second master, Pieter Lastman, and would later open his first workshop together with Jan Lievens (1607–1674) in Leiden. There are only two other possible artists who could have painted this portrait, Catellani points out: Jan Lievens or Isaac de Joudreville (circa 1612–circa 1645), who was one of Rembrandt’s first students. But neither of them have any characteristic traits that can be found in this painting. Their styles are completely different from Rembrandt’s, and besides, de Joudreville would have been in his early teens if this portrait was indeed painted in the mid-1620s. Anna Catellani would have had no problem proclaiming this a work by Rembrandt, but she has been treading carefully. Is it possible to tie the portrait to Rembrandt by scientific means? After a number of thorough scientific examinations, she is getting close to an answer. She has had help from the most prominent Italian and Dutch researchers in this area, headed by the Italian art historian Roberta Lapucci. The painting has been conserved and restored through the years, and the back has been relined, that is, reinforced with a second canvas. The first step in examining it was to remove this support added in a later era and take a look at the original canvas. 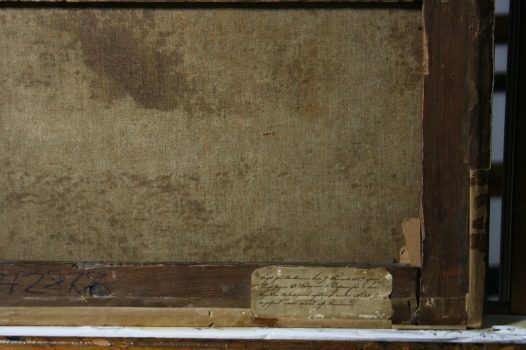 In the process of removing the stretcher (a frame to stretch the canvas), they found a very valuable French handwritten note and a piece of newspaper that confirmed the painting had been in France. The painting belonged to Swedish art professor Otto Wallgren, who died in Paris in 1857 and left behind a significant art collection. Wallgren was an orderly man who cataloged all the masterpieces he managed to buy in Europe, such as works by da Vinci, Velázquez, and Raphael. The portrait that Catellani is working on is number 13 in Wallgren’s catalog, which is preserved at the Royal Library in Stockholm. The painting is referred to as “Rembrandt—portrait of a male.” Another painting in the same catalog is described as “after Rembrandt,” meaning it was painted by someone else, so Wallgren was very careful in his definitions, Catellani says. When she started examining the physical structure of the painting, several questions arose: What kind of canvas is it? How old is the canvas? How was the canvas woven? How was the canvas stretched? A lot of valuable information is preserved about this process from other paintings that we know are from Rembrandt’s hands. It is known that Rembrandt stretched his canvases with strings, going through small holes at the edges of the canvas. He did this so that the canvas could be dampened to make it shrink, in order to then stretch it again. This was a common procedure in painter workshops and found on this portrait. Carbon dating was performed on the canvas fibers, as well as an X-ray examination. One of the X-rays showed another painting underneath the portrait. It is known that the artist would often re-use canvases of paintings he wasn’t satisfied with, as canvas was expensive. After several months of studying the X-ray of the painting underneath, Catellani was finally able to make out a hand. “What’s so important about the hand? Well, we see the same hand in several of his first paintings of 1624–1625,” she says, mentioning the painting “A Peddler Selling Spectacles” as an example. The composition of the paint, in each paint layer, provides a wealth of information that must be taken into account in any investigation. Here, the team hoped to find traces that would point to the 17th century and Rembrandt’s context. 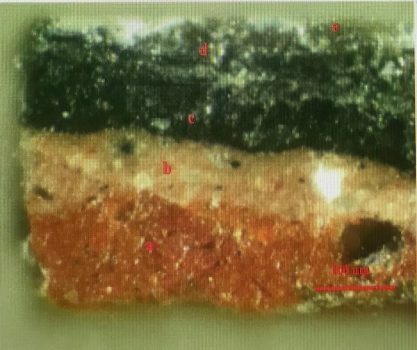 The tests show that the painting contained the same pigments and materials that Rembrandt used in his workshop. 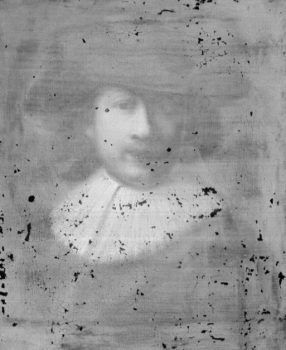 According to an X-ray fluorescence (XRF) examination, it contains the same type of metals typically found in Rembrandt’s paintings. “The content of the actual body of the paint is 100 percent consistent with what was found in Rembrandt’s studio and on his palette,” Catellani says. On the canvas is a coat of glue, according to what the Flemish 17th-century tradition prescribed. Artists used a technique similar to that used in Italy: applying animal glue to the canvas to seal it—in other words, a primer. Between the glue primer and the paint layer exist two coats of ground color. Each artist had a personal way of building up layers of paint. Here, too, the team was able to find elements they could tie to the workshop of Rembrandt and his working manner. The ground can be more or less thick depending on the final desired effect, Catellani explains. She zooms in on an area of hair in the painting on the computer screen. It’s clearly visible that the red ground bleeds through the surface, giving warmth to the hair. This is a conscious reserve technique called “a risparmio,” and this is also a characteristic Rembrandt trait. So, materials and methods are compatible with the early-period Rembrandt. In addition to those mentioned, the bluish undertone in the skin contains ultramarine and smalt. And the darker side of the face is done with rough brushstrokes, while the lit side is smooth, with a glazed surface. These, too, may be said to be Rembrandt traits. There are even more scientific facts than those mentioned above that support the conclusion that this portrait was painted by Rembrandt. After the extensive mapping work, the next step is to see how the world reacts to the news of a Rembrandt self-portrait being found in Sweden. The plan is to unveil this painting within 18 months, possibly in Malta. At the moment, the painting is in the new owner’s private collection in Sweden. Catellani says that during this investigation she’s been afraid that someone would “kill” the painting, designating it as one not painted by Rembrandt. 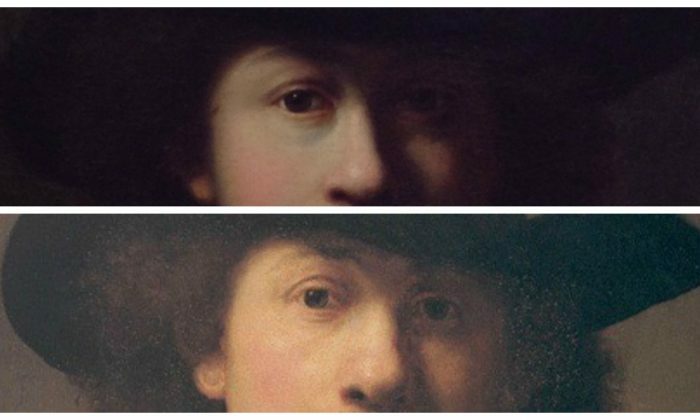 Attributing a painting to Rembrandt is no easy process. It can take decades for art historians to reach a consensus. In fact, they may never reach a consensus; many important cases in art history remain contentious.